Special counsel Robert Mueller urged a federal court on Wednesday to reject former Trump campaign policy adviser George Papadopoulos’ last-minute attempt to postpone his upcoming prison sentence. Papadopoulos is scheduled to surrender Monday to the Bureau of Prisons to begin a 14-day sentence stemming from his guilty plea last October for making false statements to the FBI. But after hiring new lawyers, the 31-year-old Papadopoulos has shifted course and tried to reopen his case by citing a pending appeal from a longtime aide to Roger Stone who is challenging Mueller’s underlying appointment to investigate connections between the 2016 Trump campaign and Russia. In a six-page reply filed in U.S. District Court for the District of Columbia, Mueller’s prosecutors shredded Papadopoulos for trying to back his way out of his original guilty plea while noting point blank to the judge that there is “no pending appeal in this case” for him to even rule on. The special counsel lawyers also described Papadopoulos’ initial charges of lying to the FBI about his interactions with a foreign professor who he knew had ties to the Russian government and a Russian female national. And they highlight the terms of the guilty plea, including an explicit agreement to waive his rights to challenge his sentence unless there was newly discovered evidence or ineffective counsel. Rehashing Papadopoulos’ own statements during his guilty plea hearing, the Mueller prosecutors reminded the court that the defendant had said he was “grateful for the opportunity [he] was given to assist in this investigation” and had “nothing but respect for the Court and the legal process.” Those comments led U.S. District Court Judge Randy Moss to give Papadopoulos a 14-day sentence, followed by 12 months of supervised release and a $9,500 fine. Mueller’s team also quoted from a series of Papadopoulos’ since-deleted Twitter posts — “Biggest regret? Pleading guilty[. ]” he wrote on Nov. 9 — as well as media appearances where he had questioned his original decision and began signaling his plans to withdraw from the agreement with Mueller. Papadopoulos’ new attorneys last week initially asked Moss to delay the prison sentence, and they followed up Wednesday with a motion formally requesting a stay. The attorneys haven’t relied on any new factual allegations in their motion but instead argue that an appeal in another case — filed by the former Stone aide who is resisting a Mueller grand jury subpoena — raised serious issues about the special counsel’s legitimacy and should be resolved before Papadopoulos is required to begin serving his sentence. 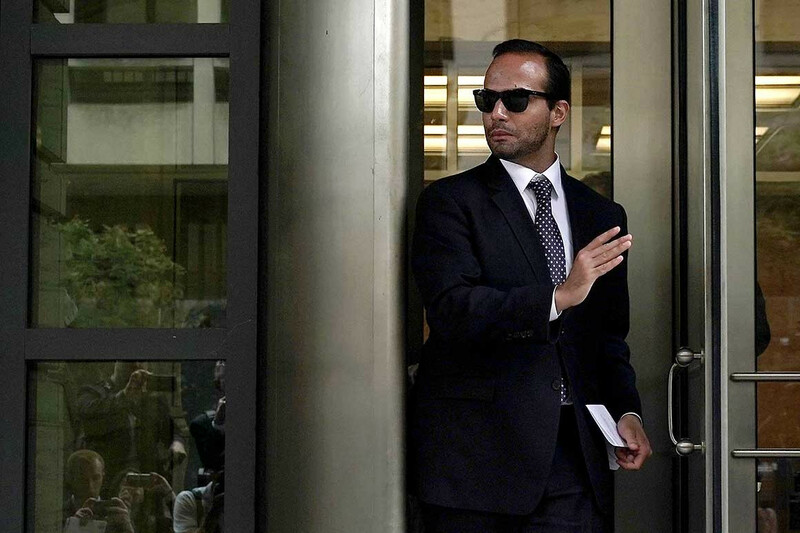 “If Mr. Papadopoulos is required to surrender during the pendency of his motion for bail pending appeal, the purpose of his motion would be frustrated,” Christopher LaVigne, one of Papadopoulos’ new lawyers at the firm of Pierce Bainbridge, wrote on Wednesday. A three-judge panel heard oral arguments earlier this month in the case involving Mueller’s authority, which pits former Stone aide Andrew Miller against the special counsel. Miller’s attorneys have signaled they want to see their case taken all the way to the Supreme Court, where a conservative majority that includes new Justice Brett Kavanaugh would be a more receptive audience. But that fight is likely to take months with no guarantee it will even get a hearing before the Supreme Court.